Cromer Museum01263 513543work MuseumStep inside this cosy Victorian fisherman's cottage and imagine what it was like to live in Cromer at the end of the 19th Century. Browse in the Old Cromer Gallery with its huge archive of historic photographs and illustrations of the town. Discover Cromer's history as a Victorian seaside resort with its fine hotels and scandalous mixed bathing. Visit the Geology Gallery and see an amazing collection of fossils - all found in Norfolk. Enjoy fascinating displays revealing why Cromer is renowned as a geological area of international importance. Find out about the famous West Runton elephant, Britain's oldest and most complete elephant fossil and see some of its actual bones. Marvel at a cast of the skull of a Mosasaur - a huge marine reptile common off the North Norfolk coast over 80 million years ago. Step inside this cosy Victorian fisherman's cottage and imagine what it was like to live in Cromer at the end of the 19th Century. Browse in the Old Cromer Gallery with its huge archive of historic photographs and illustrations of the town. Discover Cromer's history as a Victorian seaside resort with its fine hotels and scandalous mixed bathing. 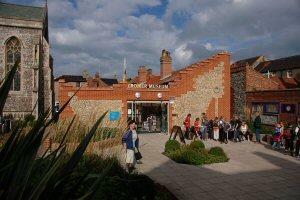 The A149 coast road goes through the centre of Cromer and passes museum. From any of Cromer's car parks head towards the large church tower. The museum is next door. From Cromer station, coach park, bus stop or car park head for the tall church tower in the centre of town. The museum is just by the church. There are several well signposted car parks nearby. Cromer has good public transport links, and has regular train, bus and coach services, mainly to and from Norwich and Sheringham.